You may have a piece of vintage McCoy Pottery and not realize it. Over 50 years ago, when I gave birth to my first daughter, someone brought me a beautiful planter with various plants. Over time the plants died, and I put the planter away, thinking someday I’d re-plant it. Years later, I came across it while cleaning out a cabinet. I looked on the bottom and saw the name McCoy, so I thought, if it’s got a name it’s worth looking up. I went to the library (no home computers then) and looked through books about McCoy Pottery until I saw the exact planter. The value of the planter shocked me…it was worth much more than the plants that were in it. 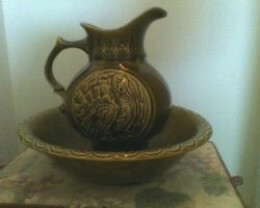 I began to look for McCoy Pottery at yard sales, flea markets, etc., and found a few pieces. That began my collection and it continued until just a few years ago. Oh, and today, my oldest daughter owns that original planter which was in the Wild Rose pattern. I thought it only fitting that she should have it. These are heirloom pieces, handed down from generation to generation. One of the most coveted pieces of McCoy Pottery is this Wishing Well Planter. I have one of these and green plants just naturally fit with this glazed brown color. A big beautiful Pothos plant and vine would go nicely here, or for that matter, any plant. Or you could do what I do, and just admire it without plants. A McCoy By Any Other Name…. McCoy Pottery didn’t start out with that name. As a matter of fact, they actually didn’t start out making decorative items for the home. They began the company in 1910, making sanitary and utility stoneware under the name of Nelson McCoy Sanitary and Stoneware Company. About 1918 they merged with other stoneware companies and formed American Clay Products Company. All the products made were unmarked and this company survived until 1926. When the coalition broke up, each company went their separate ways and began competing with each other. The company then became known as Nelson McCoy Sanitary Stoneware and began marking their pieces. In 1933 the demand for decorative pieces for the home caused the company to once again change its name, this time to The Nelson McCoy Pottery Company. This was how matters stood for 57 years until the company went through three different owners between 1967 and 1990, when the Nelson McCoy Company closed its doors. Since that time, there have been applications to use the McCoy trademark, but none have followed through. Below are some books containing photos, description and value of McCoy Pottery. Don’t overlook the possibility of owning a valuable piece, or stumbling across one while cleaning out a relative’s belongings after they’ve passed away. These pieces deserve being saved and protected. I’ve never owned any of the McCoy Golden Brocade Pottery, but I’ve seen it when I was still collecting McCoy. It’s quite beautiful and makes a lovely display when you put several pieces together. The Golden Brocade is getting to be more scarce every year, and I suspect it’s because people are hoarding it, hoping the prices will go up. Which is quite possibly the case, because each year these pottery pieces survive, they grow more beautiful and more valuable. This photo was made by my friend Judith Schweitzer in my home, March 5, 2013. Imagine this vase with cut flowers in it. What a gorgeous display it would make. More Information About Vintage McCoy Pottery – Make Sure Yours Is A “Real McCoy,” by Checking The Mark It Bears. Information about McCoy Pottery, recent reproductions, faked products, history of the company.